Perched on a unique ridge named "Worlds View" within the Vilanculos Coastal Wildlife Sanctuary. Gaze in awe from this isolated vantage point of the ever changing turquoise seas emerging the sandbanks and crisscrossed with local Dhows. An Eco-lodge in the truest sense; Azulik only engages in fair trade with the local community and endeavors to protect the cherished vegetation and animals located on the lodge grounds. 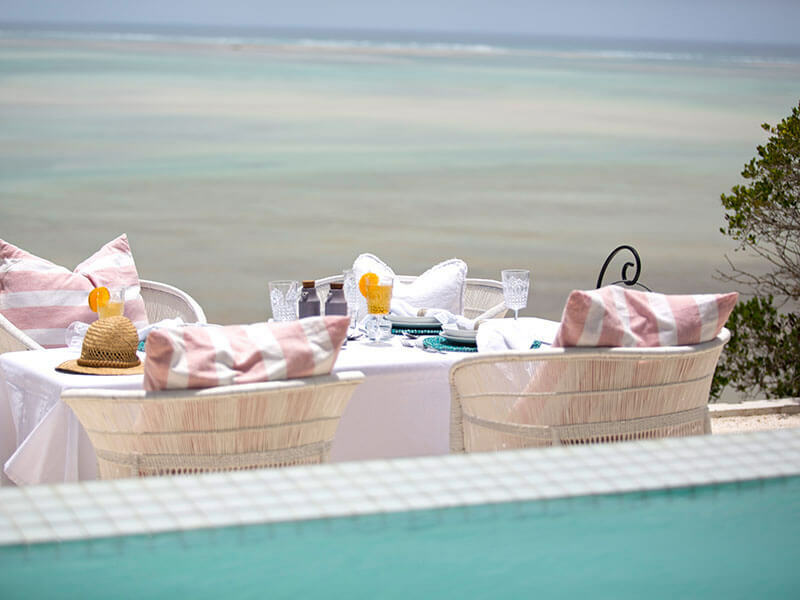 Indulge in the legendary local cuisine, catering in nutritious and delicious indigenous plant and sea food sourced from local villages. 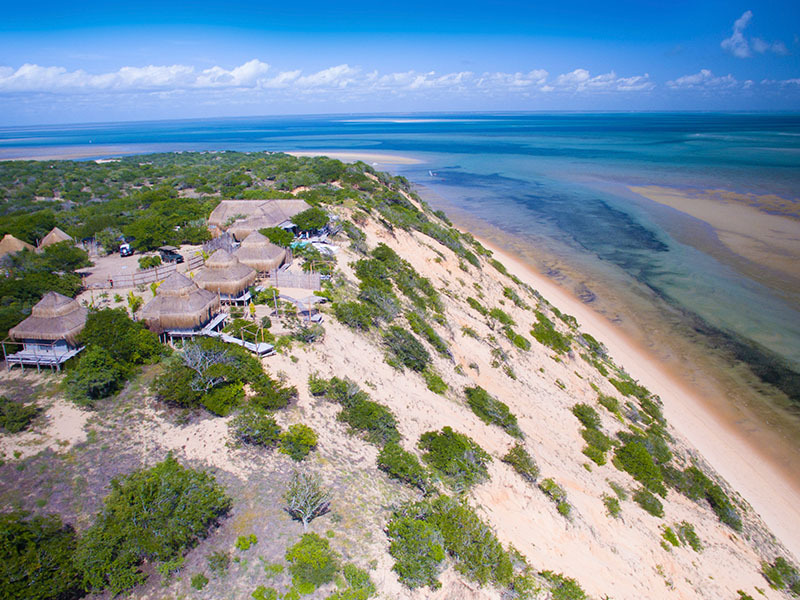 Azulik Lodge is situated within the Vilanculos Wildlife Sanctuary on the San Sebastian Peninsula which forms the southern-most portion of the Bazaruto Archipelago in Mozambique. 30 000 hectares of marine and wildlife territory make up The Wildlife Sanctuary, the first privately managed specially protected National Park in Mozambique. 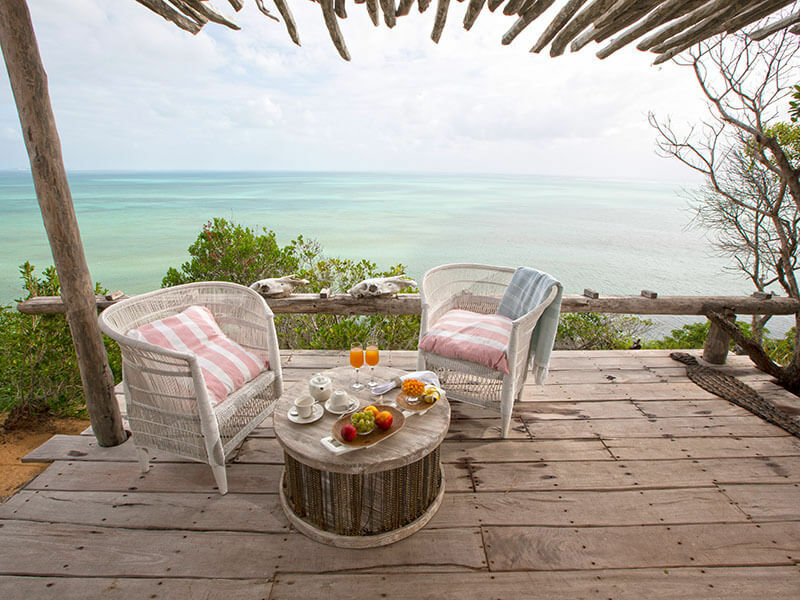 Overlooking the Bazaruto Archipelago, visitors to Azulik enjoy a diverse eco-system of wilderness and wetland where marine and bush animals are in abundance. 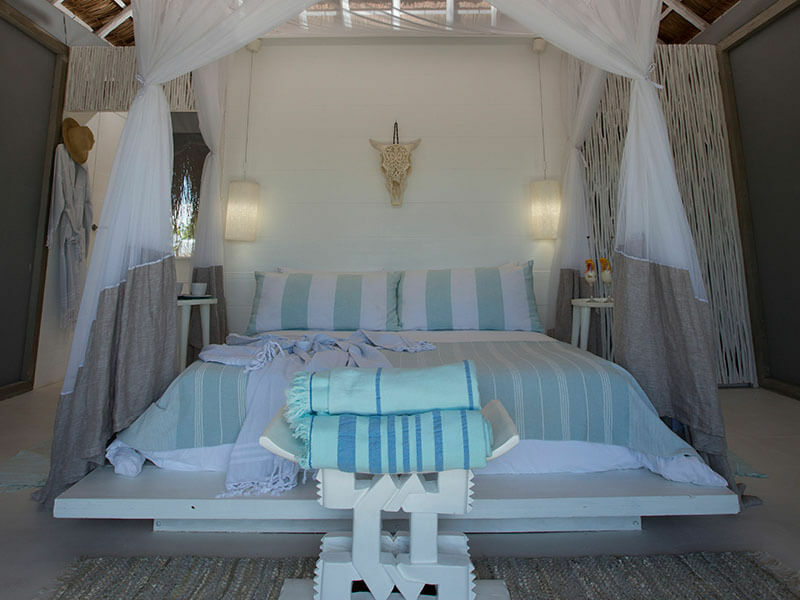 Conservation, community development and eco-tourism are integral in the Azulik ethos. Fair trade with the local community and ongoing endeavors to protect all unique vegetation and animals at the lodge are what Azulik is all about. 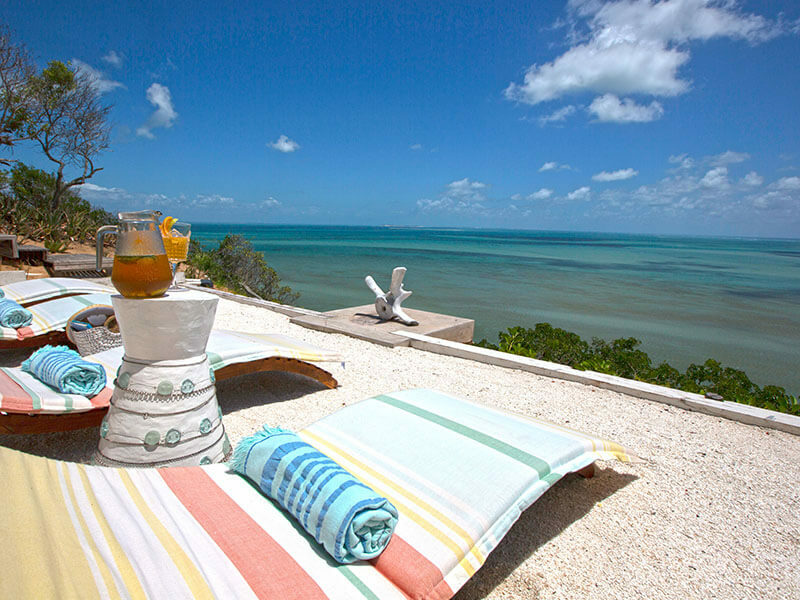 Azulik Lodge offers tropical beach holidays combined with a wildlife experience. Game drives within the sanctuary are included in your stay. This eco-lodge embraces African contemporary interior design and traditional African architecture with the complete solar power ensuring environmental kindness during your stay. The main building offers an open plan lounge, dining and bar area. 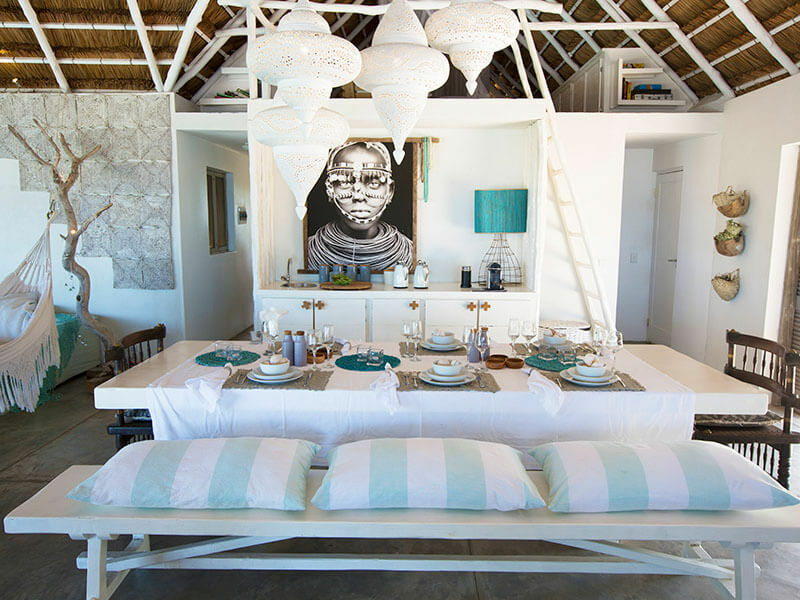 The African-contemporary interior design is complemented by traditional African-architecture. This unique combination is further enhanced by the breathtakingly beautiful surroundings and sea view. 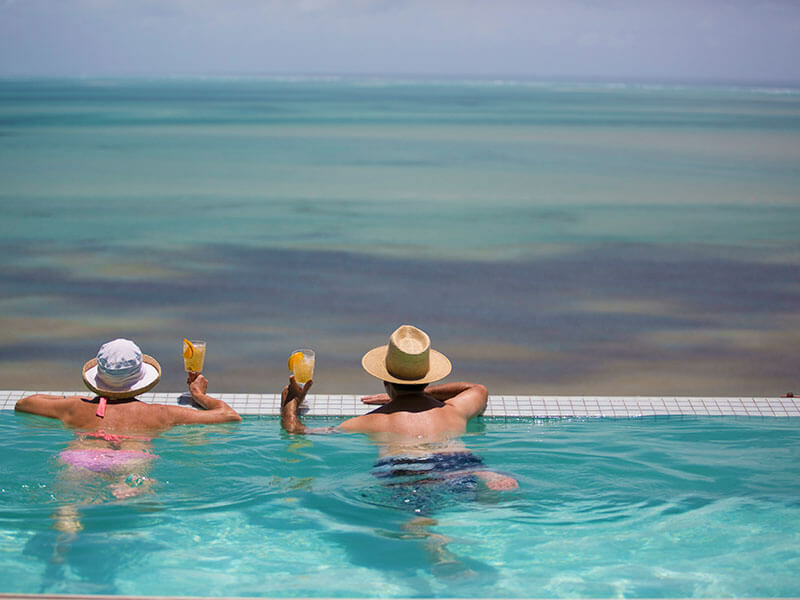 Cool off in the infinity pool or simply soak in the sun. 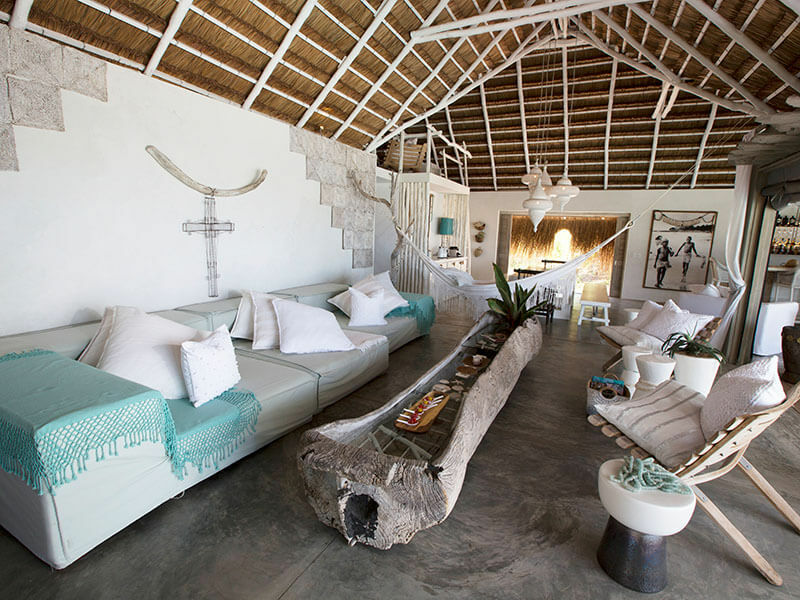 Scattered hammocks, hang beds & sunken seating around the pool promise an indoor-outdoor experience. TV and games are available. As we are completely solar powered you can be rest assured that your holiday will be kind to the environment. Adjacent to the main building are four luxury thatched and tented rooms. Each unit accommodates two guests and is connected to the main building via hardwood walkways. 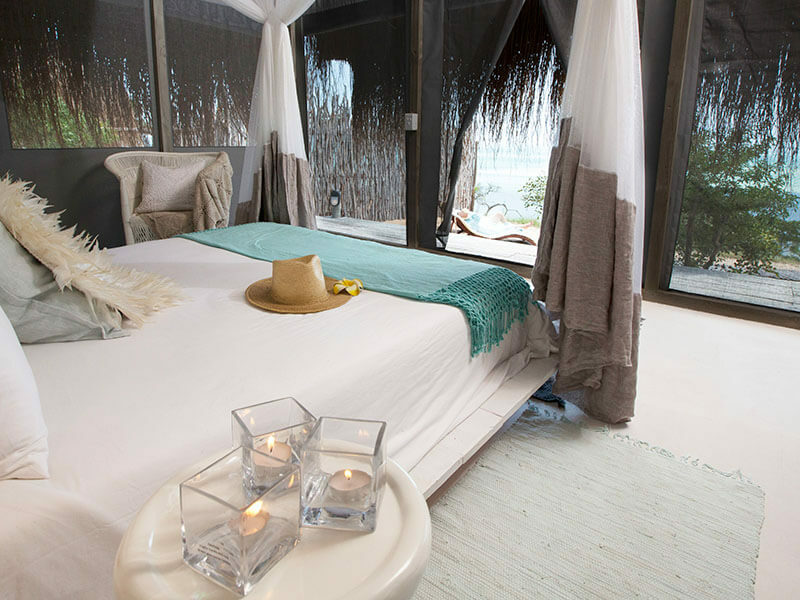 Step outside to your room’s private viewing platform and enjoy the unique and majestic view that each thatched tent has to offer. 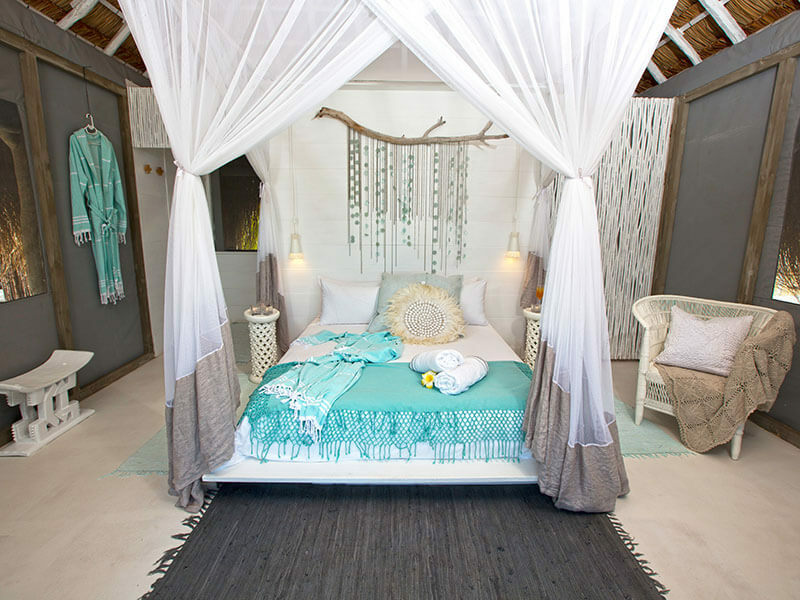 Azulik Lodge is offered as a unit on its own, which means the client will enjoy the entire lodge to themselves. 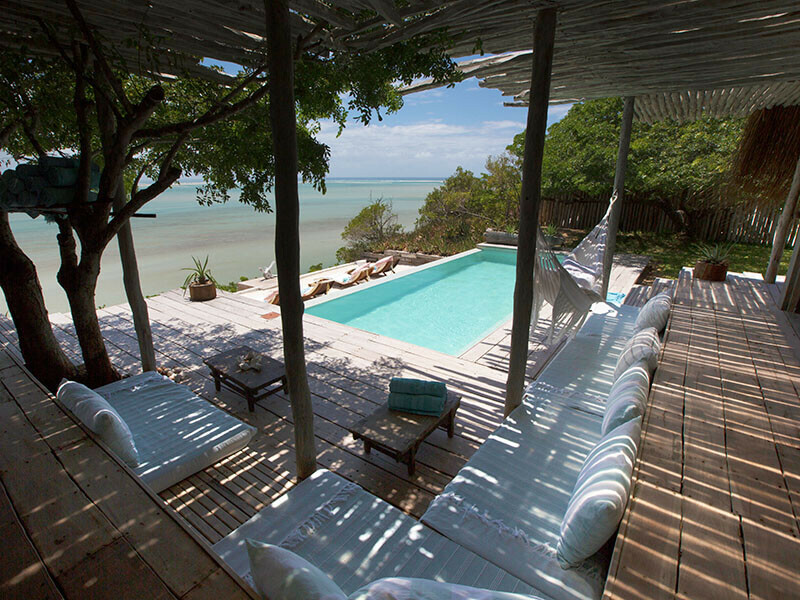 Adventurous guests who would prefer to drive – Vilanculos is approximately 700km North of Maputo. 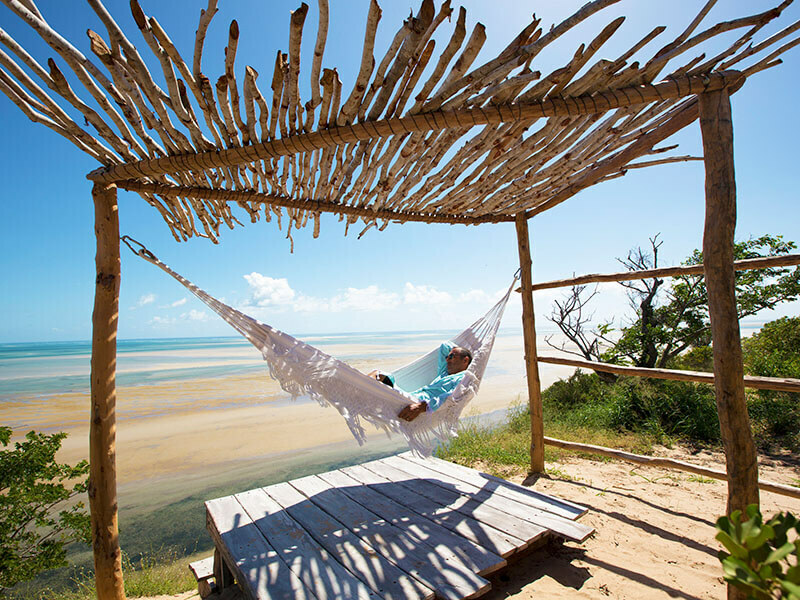 It would be best to do the trip over two days with a stop at Inhambane, since the journey can be quite long. Daily flights are available from OR Tambo International Airport in Johannesburg to Vilanculos Airport (except on Sunday). Flights are also available from the Kruger National Park and charter or private flights can easily be arranged. Transfers from the airport to the Lodge must be booked at the time of making a reservation and are charged separately as the cost varies considerably depending on pax or mode of transport. It must be noted that, at times, there may be a delay in the transfer to Azulik Lodge should passengers be arriving at different times on different airlines. Transfers to the lodge can either be via boat (45 min), helicopter (10 min) or hovercraft (35 min). If transfer is via boat, you may be required to wade through knee-deep water, so bear this in mind when choosing your attire. Once you arrive at the sanctuary, you will be met by Azulik game viewing vehicle, and driven the 20 min drive to the lodge. Here a warm welcome and an ice cold cocktail await you. VISAS for Business and Tourists can be issued on arrival. South African passport holders do not require a visa.